To ensure the best longevity for your precious piece of jewellery it is important to ensure that you look after them properly. 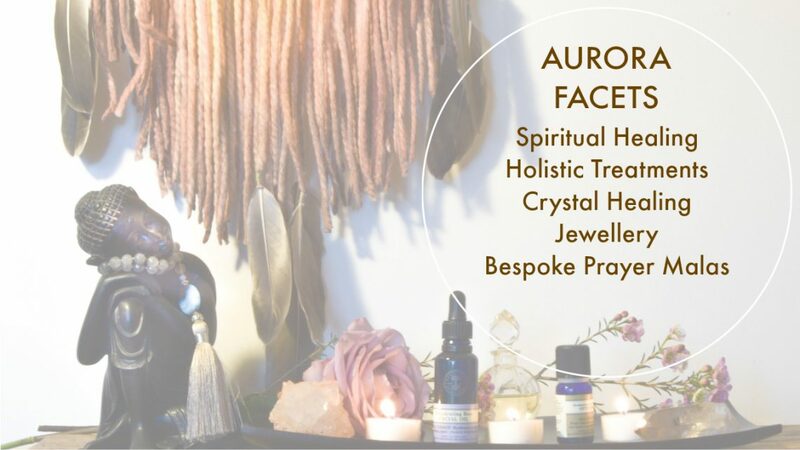 Aurora Facets jewellery contains usually crystals, semi-precious gems as well as silk, certain metals, perhaps wood and seeds, therefore it is important to ensure you use a cleaning method to suit all eventualities. Below are some common sense tips as well as cleaning and re-charging information. All information is devised to give you and your meditational piece longevity together. Please avoid oils, scents, sprays etc on your beautiful item, as this will reduce the quality of the silk as well as sully the crystal and metal elements. When wearing your piece, please be mindful of snagging ie on hoods and scarves, to avoid snapping the silk. Please do not immerse your piece in water, silk threads will not like this and certain crystals contain metals which do not mix well with water ie rust. Crystals in loose housings, ie no metal casings, more like a charm will be more vulnerable to breaking if hit upon something as opposed to a crystal within a metal casing. Most of my malas use 8mm beads, hence they hang quite low if the doubled up option is not used. With the heavier longer pieces, from personal experience, I have regularly been reminded to be careful when leaning forwards i.e. when sitting at a table to eat, as the pendant piece will inevitably swing forwards and if it were to meet a marble table or other hard surface could come to an untimely end. I instinctively hold mine now when leaning forward. Please roll on bracelets that are stretch elastic rather than pulling wide to put on, this will ensure that over weakening of the elastic does not happen. To clean metal casings etc, please just use a dry soft cloth gently like for cleaning glasses, that is all that is needed, no chemicals etc are needed. You can also shine up the crystals this way too. When not wearing your mala it is recommended to store if flat rather than to hang it up constantly. Keeping it on an altar or dedicated space is ideal. Crystals contain their own resonance, but often pick up energy from other people handling them or from places/situations. Therefore though I energetically cleanse all crystals before they are put up for sale either online or be it in a shop, that you energetically cleanse, dedicate and attune your piece before use. I would recommend this with all crystal/gemstone pieces that you own, especially if an old piece that you might have inherited from someone. With this in mind, I recommend that you do not share your crystal pieces, especially your malas which are your own personal meditational prayer beads. I feel very much that the pieces are attracted to, and inevitably end up in the home of the person they were always meant to be with. Therefore they are keepsakes rather than fashion pieces and all are made with unconditional love and with the purpose to heal and protect the wearer. My favourite method is smudging. Smudging is a way for brushing away negative energy using sacred or scented smoke as well as with gemstone jewellery to clear their energies. Smudging sticks are usually made of herbs, precious woods or resins, like sage, cedar, sandalwood, frankincense, juniper and more. Sage is probably the most popular or known one. You could also use incense if you don’t have smudger. Fan the smudger carefully with either your fingers or a feather to make it smoulder and give off smoke. Ask the Divine in a small prayer to help clear the energy of the crystals for the highest good of all concerned. Pass the crystal piece through the smoke between three to seven times or brush the smoke over the crystal, whichever easiest. Use the abalone shell under the smudger to catch the ash. When finishing, please remember to thank the crystals and the Divine. Breath: With your crystal held in your hands, begin by breathing slowly and centring yourself. Focus on your crystal, take a long slow breath, and pause while focusing. Raise your crystal and exhale with a burst, visualizing and feeling static and ambient energies spontaneously releasing from the crystal’s light matrix. Repeat until you are satisfied (or light-headed). Clear Quartz, in particular, loves sunlight. In the warm summer months, you can place your Clear Quartz crystals outside in your garden in a safe place away from children, pets and hungry squirrels. If you don’t have access to a garden then a sunny windowsill is just as good. This is also the best way to let the crystal re-charge during the winter months. Other crystals can be cleansed and charged in sunlight but be aware that they may be prone to fading, especially if they have a strong colour like Brazilian Amethyst, so short periods of exposure are advisable with coloured crystals. I would also not recommend the light method if your piece has silk tassels as the colour can fade if left under sunlight for too long.. If tassels get a bit dishevelled you can easily just dampen them slightly and re-shape and then leave in your desired shape to dry. With any silver and gold pieces, if they tarnish slightly which inevitably they will do with wear, then just giving them a gentle rub with a very soft cloth will sparkle them up instantly. Moonlight: Moonlight is a gentle and penetrating method for recharging your stones. The light of the full moon is desirable, being brightest, but the light of any phase will serve. Amethyst, rose quartz, citrine, smoky quartz, moonstone, calcite, celestite, kunzite, aquamarine, and other light or pastel coloured stones are revitalized in the moonlight. This is a gentle technique for regenerating personal stones overnight. Crystal Layout: Combine this method with any of the above methods for recharging crystals. This method may also be used while cleansing crystals. Arrange several single and double-terminated clear quartz crystals around the cluster, tabby (or bowl) in which your crystal is being recharged (or cleansed), or around the crystal itself. For example, arrange the crystals according to the four cardinal directions, North, South, East and West, otherwise known as the medicine shield. The crystals will channel fresh energy to recharge the crystal in the center. If you want to charge your crystal with a certain vibration, for example, serenity or love, add crystals to the layout that foster that resonance, such as aquamarine, celestite, blue chalcedony, chrysoprase, rhodochrosite and rose quartz. You may also tune your crystals in harmony with the resonance of a tuning fork, a bell or a singing bowl. You can anoint the crystals with essential oils but try not to get any oil on the silk. The Crystal Layout method is enhanced by sunlight and moonlight. What If One Of The Knots Break? The good news is that with the knotting method I use if the silk does break for any reason you will be able to retain all the stones that are either side of the knot. To repair the break each bead or stone will need to be cut free, the knot removed and then finally once all the beads and stones are free they will need to be laid out in the original design and re-strung which is a time-consuming affair. If you have taken all measures above to look after your piece and it breaks within six months of purchase I will re-string it for free. If any knots break between six months and a year there will be a nominal fee for re-stringing plus a charge for any stones that might need replacing. After a year I am happy to re-string at my standard re-stringing fee. Please contact me to discuss if you need to have your piece re-strung. Disclaimer: Please note that you are responsible for cherishing your pieces if you break/smash a crystal or tear the silk, replacements/fixing will be charged at normal retail rates. Many pieces are one-off, and as such often there are no replacements, hence mindful care is of utmost importance.